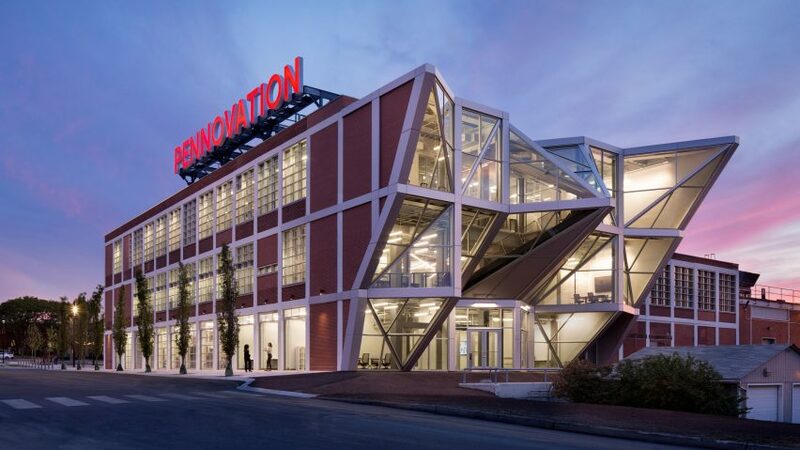 US studio Hollwich Kushner has transformed an old paint factory into the Pennovation Center, which contains labs, co-working areas and social spaces for entrepreneurs and researchers. The building is the latest addition to the University of Pennsylvania in Philadelphia, and the centrepiece of a new 23-acre (nine hectares) research campus called Pennovation Works. 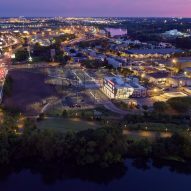 The 58,000-square-foot (5,388-square-metre) project entailed the adaptive reuse of a manufacturing building that looks toward the Schuylkill River. The facility "needed to act as a bold signpost for the initiative as well as support dynamic social interaction and cross-disciplinary efforts". "The Pennovation Center is a 20th-century paint factory, transformed into a 21st-century idea factory," said Hollwich Kushner, often referred to as HWKN. The New York-based studio was founded in 2007 by architects Matthias Hollwich and Marc Kushner, who also co-founded the architecture website Architizer. 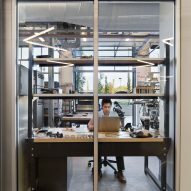 "Having personally navigated through the startup experience ourselves when we launched Hollwich Kushner and Architizer, we understand the needs and challenges of emerging companies," said Kushner. 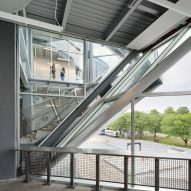 On the exterior, the architects cut a large, glazed triangle into the main facade, which announces the building's primary entrance. The facade is fronted by a plaza with a series of benches, and black and white pavers that form an artistic pattern. On the west elevation, the architects created a "spiky geometric" glass outcrop that gestures toward the river. Throughout the building, casement windows were replaced with energy-efficient glass set within a metal grid. Inside, the architects created an industrial-style atmosphere, with concrete flooring, exposed structural elements and long communal tables. The program includes a machine shop, co-working areas, equipment rooms, and labs called Start-Up Garages, which are lined with operable garage doors. There also are conference rooms and seminar rooms. The team incorporated a number of social spaces intended to "tempt entrepreneurs to leave their desks and engage with their colleagues". These spaces include a kitchen, a cafe, a bar and the Pitch, an area with bleacher seating where entrepreneurs can present their ideas to investors. The stairway off the main lobby also doubles as a seating area. Bruce Mau Design conceived several elements for the project, such as cleverly arranged fluorescent lighting and the typeface for an 11-foot-tall (3-metre) rooftop sign. The Pennovation Center has already attracted tenants such as Hershey Foods, the largest chocolate manufacturer in North America, and Liquid Biotech, which develops cancer- and gene-related technologies. The third floor of the building houses the university's Penn Engineering Research and Collaboration Hub, or PERCH. The research facility is focused on interdisciplinary engineering, such as robotics, and accelerating the development of products and systems and bringing them to market. "The building inspires creativity within, while simultaneously telling the world outside that Penn is a leader in the field of innovation," said the architects. Other projects by Hollwich Kushner include the Fire Island Pines Pavilion in New York and Wendy, a summer installation at PS1 Contemporary Art Centre in Queens. Photography is by Michael Moran.